Japan’s Baseball Hall of Fame and Museum announced on January 16, 2017 that Mirei Suzuki (1921–1991), a former member of the nation’s Baseball Rules Committee, and Hiroshi Goshi (1932-2006), a longtime umpire in high school, college and industrial league baseball, were chosen by the Special Selection Committee. They received votes on 12 of 14 valid ballots. 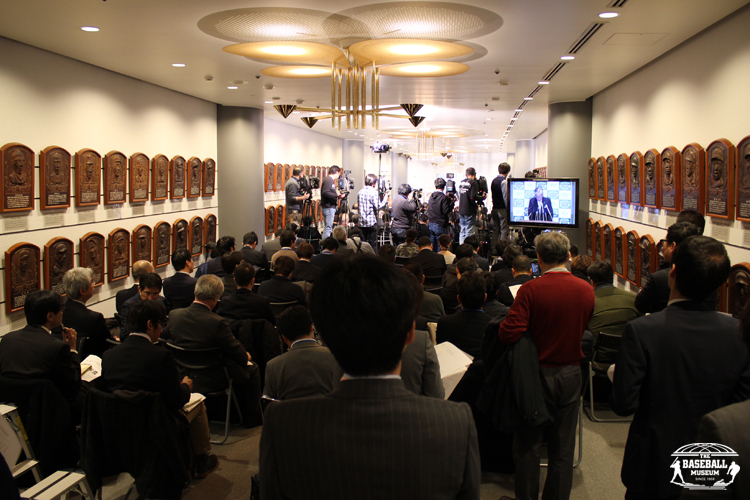 Two members of professional experts category; former Chunichi Dragons Senichi Hoshino and The Taiyo Whales’ (now Yokohama DeNA BayStars) Masaji Hiramatsu, and one professional players category; former Seibu catcher Tsutomu Ito were also voted into the Hall of Fame bringing the total number enshrined to 197. Seventy-five percent — or 250 votes from veteran baseball-covering media and Hall inductees who have been enshrined at least from the previous year — was needed in the players category this time. The same percentage of votes (84 in this case) was also required for entry via the experts category, which features former players and coaches. Mirei Suzuki went to WWII under the student mobilization order in the middle of his studies (and baseball club) at the Tokyo Imperial University (now the University of Tokyo). After being demobilized, he worked with The Mainichi newspaper as a sports writer and was instrumental in running the Rules Committee from 1955 to 1991. Up until 1955, Japan’s professionals and amateurs relied on the rule books of their own which were consolidated in 1956 and subsequent issues have been renewed annually by reflecting the changes in the Official Baseball Rules of the Major League. Suzuki paid careful attention to the Japanese translation so that it may accurately convey the meaning and implication of the U.S. Rules and often referred to the Major League for clarification. Suzuki read the Stars and Stripes of the U.S. occupation forces to learn what was going on at the Major League during the time when there had been limited supplies of news from overseas. Hiroshi Goshi started his carrier as an umpire during his time at Meiji University’s Baseball Club and officiated the collegiate games of Tokyo Big-6 during 1954～57 and 62～83. He served as an umpire for National Championships at Koshien (Japan High School Baseball Federation) during 1964～83 and helped Inter-city Baseball Championship of Industrial League including the game watched by Emperor Showa in 1969. After his retirement, he promoted to improve umpiring skills and taught younger people by touring throughout Japan. He shared Mirei Suzuki’s goal to building one’s character and lifestyle through baseball as a part of education, worked closely each other and published umpiring and baseball rules jointly. Goshi received the Asahi Sports Award in 1999. The five will officially be inducted into the Baseball Hall of Fame later this year. The date will be announced later.